Um Janine, stop smiling and turn around! Early on during The Real Ghostbusters Samhain was a boss among ghosts, a master of his domain. That domain, Halloween! When we’re first introduced to Samhain during When Halloween Was Forever he had been locked away in an ancient clock for centuries. Wouldn’t you know, to prepare for the coming of Halloween, a couple of goblins free him. The “little ones” as Samhain calls them travel all over NYC gathering ghosts that usually keep The Real Ghostbusters in business. Instead of sight seeing (I suppose ghosts don’t normally do that kind of thing) Samhain uses his powers to make the night eternal so Halloween will last forever! What ‘ol pumpkin head hadn’t realized is their are a group of men and a woman who have the smarts, skills, and technology to ghost bust every last one of these lower class specters. This never makes the self proclaimed leader of Halloween happy. His negative emotions and the fact that he has a pumpkin for a head allows The Real Ghostbusters to tap into his weakness, the light. Which seals Samhain and his little ones fate. Samhain would appear to adjust to life inside the Ecto-Containment Unit. (Partners In Slime) Perhaps he was just waiting until he could truly be free again, free to turn any night into the eternal night of Halloween! After all how many hands of Go Fish can one who un-lives play? Unbeknown to The Real Ghostbusters Samhain’s goblins would eventually free Samhain (Halloween II 1/2) who sought revenge for his imprisonment. Revenge is swift. A ghost army is formed and the firehouse is transformed into a Halloween fortress. The Real Ghostbusters try what worked before to no avail. Like all bad guys Samhain makes a crucial mistake. He leaves the fortress with his ghost army to look for The Real Ghostbusters. This gives the “Jr. Ghostbusters” time to get inside what was the firehouse to look around with a camera. Despite The Real Ghostbusters discovery of a “timestone” in place of where The Ecto-Containment Unit once stood Samhain returns and the kids become hostages to Halloween. This could be a major problem for any government agency, not The Real Ghostbusters! They go on the attack fighting Samhain. Which gives Slimer enough time to rescue the kids. Once they’re safe, The Real Ghostbusters destroy the “timestone.” This sets off a chain reaction, destroying the fortress. The Ecto-Containment Unit is revealed and has been opened the entire time! Samhain and what’s left of his “little ones” are pulled back inside, to be “imprisoned”* once again. Samhain is one of the few The Real Ghostbusters ghost characters who remains popular among ghostheads. Besides appearing in an episode and a special during the series, he was seen five other times, including the intro from season 4 onward. Samhain was featured in both NOW c o m i c s (Issue 17, Chanted Evening) and IDW Ghostbusters. (In The Box Part I & II) Samhain appeared in video game form twice. Well, the ghosts resembled him in appearance anyway. (New Ghostbusters II, a mobile game) Despite never having a regular episode about Samhain during the Extreme Ghostbusters, Samhain appeared in both the intro and end credits. 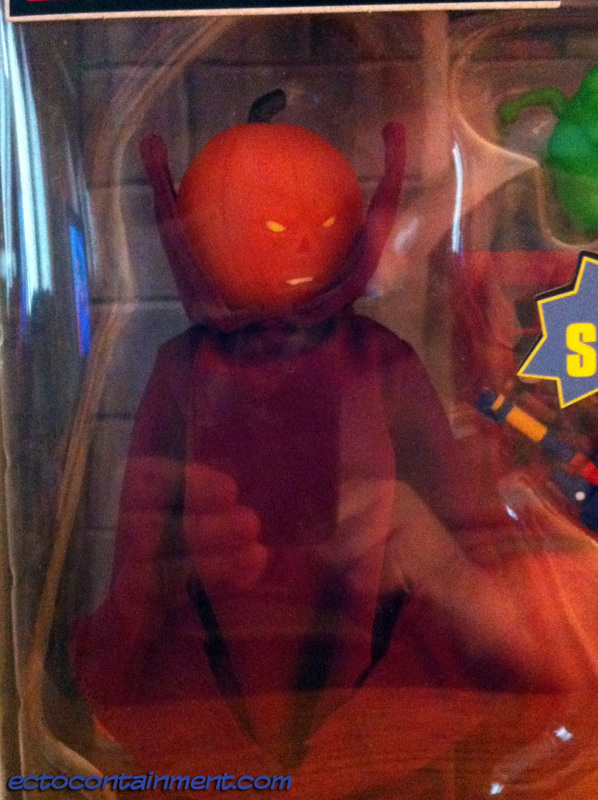 In the late ‘90s toy company, Trendmasters produced a Samhain figure. Something Kenner didn’t do a decade earlier. Even with the character’s massive popularity. In recent years toy company Diamond Select/Art Asylum made Samhain into a Minimate figure as part of their The Real Ghostbusters Minimates series. When I first heard about and saw this Retro-Action set in pictures I thought it would have made more sense based on how the set is presented overall if Mattel had given us The Sandman instead. Although it was only in a dream state Janine became a Ghostbuster in Mr. Sandman, Dream Me A Dream. It doesn’t take long to see that the odds are in Samhain’s favor over Mr. Sandman in just about anything ghost related. The Retro-Action Matty Collector team, if their was one did an excellent job with both Janine and Samhain. The expression seems perfect, it really helps to capture Samhain’s reason for un-life. His “ancient” robes in a velvet patten really work well. A lighter cloth like the Retro-Action The Real Ghostbusters wouldn’t have looked right. 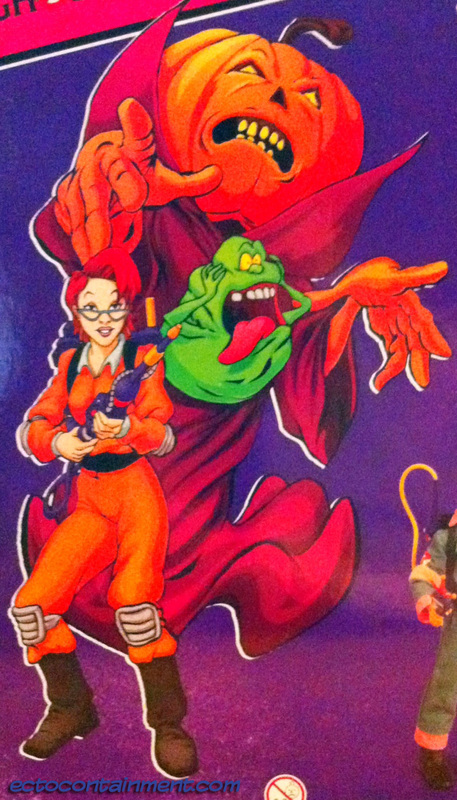 I love how he seems to be looking at both Slimer and Retro-Action Janine at the same time. Just as Retro-Action Janine has her eye on Samhain, retro-action nutrona wand pointed up towards him. I can understand business, Samhain deserved his two goblins as accessories. *From a jailer/criminal point of view ghosts are technically “prisoners” inside The Ecto-Containment Unit. They appear free to un-live their lives in a ghost world most of the time. The Ecto-Containment Unit is the safest place for any ghost who had been hanging around Earth in the modern era. References: Episode titles, some information about Samhain.